The many genera of wolf spiders range in body size (legs not included) from less than 10 to 35 mm (0.4 to 1.38 in). They have eight eyes arranged in three rows. The bottom row consists of four small eyes, the middle row has two very large eyes (which distinguishes them from the Pisauridae), and the top row has two medium-sized eyes. Unlike most other arachnids, which are generally blind or have poor vision, wolf spiders have excellent eyesight with their large eyes. The sensory hairs on their legs and bodies give them an acute sense of touch. Flashing a beam of light over the spider produces eyeshine. The light from the flashlight has been reflected from the spider's eyes directly back toward its source, producing a "glow" that is easily noticed. This is also especially helpful because when the nocturnal wolf spiders are out hunting for food it makes it easier to find them. Wolf spiders possess the third-best eyesight of all spider groups, bettered by jumping spiders of the family Salticidae (which can distinguish colors) and the huntsman spiders. Wolf spiders are unique in the way that they carry their eggs. The egg sac, a round, silken globe, is attached to the spinnerets at the end of the abdomen, allowing the spider to carry her unborn young with her. The abdomen must be held in a raised position to keep the egg case from dragging on the ground. However, despite this handicap, they are still capable of hunting. Another aspect unique to wolf spiders is their method of care of young. Immediately after the spiderlings emerge from their protective silken case, they clamber up their mother's legs and crowd onto the dorsal side of her abdomen. The mother carries the spiderlings for several weeks before they are large enough to disperse and fend for themselves. No other spiders are currently known to carry their young on their backs for any period of time. Because they depend on camouflage for protection, they do not have the flashy appearance of some other kinds of spiders. In general, their coloration is appropriate to their favorite habitat. Hogna is the genus with the largest of the wolf spiders. Among the Hogna species in the U.S., the nearly solid dark brown H. carolinensis (Carolina wolf spider) is the largest, with a body that can be more than 2.5 cm (1 in) long. It is sometimes confused with H. helluo, which is somewhat smaller and different in coloration. The underside of H. carolinensis is solid black, but the underside of H. helluo is variegated and has reds, oranges, and yellows with shades of black. Some members of the Lycosidae, such as H. carolinensis, make deep, tubular burrows in which they lurk much of the time. Others, such as H. helluo, seek shelter under rocks and other shelters as nature may provide. They may wander from place to place, so are likely to be attracted into human habitation when the weather starts to turn colder in autumn. As with spiders in general, males of almost any species can sometimes be found inside homes and buildings as they wander in search for females during the autumn. 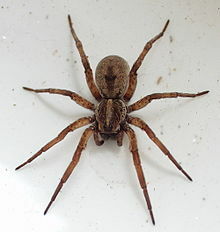 Many smaller genera of wolf spiders are found in the United Kingdom. They live in pastures and fields and feed on smaller prey, playing an important role in natural population control that keeps insect numbers in the wolf spiders' vicinity within acceptable levels. Wolf spiders inject venom if continually provoked. Symptoms of their bites include swelling, mild pain, and itching. In the past, necrotic bites have been attributed to some South American species, but further investigation has indicated that those problems that did occur were probably actually due to bites by members of other genera. Australian wolf spiders have also been associated with necrotic wounds, but careful study has likewise shown them not to produce such results. Nukuhiva Berland, 1935 — Marquesas Is. Wolf spiders can be found in a wide range of habitats both coastal and inland. These include shrublands, woodland, wet coastal forest, alpine meadows, suburban gardens, and homes. Spiderlings disperse aerially; consequently, wolf spiders have wide distributions. Although some species have very specific microhabitat needs (such as stream-side gravel beds or montane herb-fields), most are wanderers without permanent homes. Some build burrows which can be left open or have a trap door (depending on species). Arid-zone species construct turrets or plug their holes with leaves and pebbles during the rainy season to protect themselves from flood waters. Often they are found in man-made locations such as sheds and other outdoor equipment. The Carolina wolf spider (H. carolinensis) is the official state spider of South Carolina, designated as such in 2000. South Carolina is the only U.S. state that recognizes a state spider. ^ "Wolf Spiders: Lycosidae Sundevall 1833". Australasian Arachnology Society. Retrieved 2 October 2008. ^ Ribeiro, L. A.; Jorge, M. T.; Piesco, R. V.; Nishioka, S. A. (1990). "Wolf spider bites in São Paulo, Brazil: A clinical and epidemiological study of 515 cases". Toxicon. 28 (6): 715–717. doi:10.1016/0041-0101(90)90260-E.
^ Isbister, Geoffrey K.; Framenau, Volker W. (2004). "Australian Wolf Spider Bites (Lycosidae): Clinical Effects and Influence of Species on Bite Circumstances". Clinical Toxicology. 42 (2): 153–161. doi:10.1081/CLT-120030941. ^ "Family: Lycosidae Sundevall, 1833". World Spider Catalog. Natural History Museum Bern. Retrieved 2019-04-22. ^ "Carolina Wolf Spider State Spider". statesymbolsusa.org. South Carolina designated the Carolina wolf spider (Hogna carolinensis) as the official state spider in 2000 due to the efforts of Skyler B. Hutto, a third-grade student at Sheridan Elementary School in Orangeburg, SC. Platnick, Norman I. (2008): The world spider catalog, version 8.5. American Museum of Natural History. Wikimedia Commons has media related to Lycosidae.